As cloud-based software solutions move into hyper-mainstream growth in 2015, there is a huge amount of pressure on software vendors to make all of their wares available in a “cloud” footprint. Not all but the majority of enterprise buyers are now evaluating “cloud first”. Cloud-based revenues remain at double-digit growth and software-based revenues are moving into negative territory, so vendors who can't field cloud options are in trouble going forward. With pressure comes rushed solutions, partial solutions, and “cloud washing” that can confuse the picture of the new value proposition of cloud versus the old value proposition of software. With all the marketing noise, how can a buyer tell when a solution is really a cloud solution, when it's a “marchitecture”, and if the difference should matter to them? From 50,000 Feet: How Did We Get Here? Cloud-based solutions as an “architecture” didn't just suddenly arrive in 2015, 2014, or even 2013 but have actually been undergoing continuous refinement and changes for the last 10 or more years. Essential underpinnings like multi-tenancy, elastic computing capacity, or automatic upgrades were developed, tested, and improved over years with some “trial, error, and proving” to get it right. For example, one of the major “hard problems” for cloud architectures was to manage upgrades centrally. Simply put, how could one central system, running the same version of software for thousands of customers be upgraded quickly, efficiently, reliably, while everyone is still using it, and oh-by-the-way continuously year after year? The solution to the “automatic upgrades” problem takes an entirely different approach and technologies than the software-based paradigm of sending out DVD's or providing downloads with software upgrades. Because of the very different way cloud-based solutions would run and be managed and the unique technical challenges from those requirements, major vendors like Salesforce and others blazed new trails, had to “figure this stuff out”, and most importantly had to prove it was possible at a scale that involved thousands or tens of thousands of companies. While obviously biased and not at the scale of a Salesforce, we would add Pacejet to that list since we've had a lot to learn and develop to, for example, figure out how a cloud-based Shipping platform could operate with a cloud-based Carrier Network where both solution elements could be upgraded and expanded continuously. Bottom line, creating new cloud-based solutions took new engineering work, new designs, and experience built up over time. 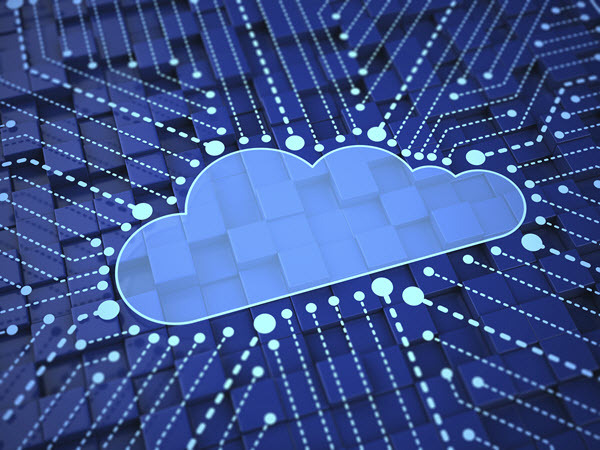 The resulting solutions engage new software, hardware, and cloud technologies that make cloud platforms look very different from older, on-premise installed application software. Subscription Not Purchase = Cloud solutions are sold as subscriptions and you pay only for the next period(s) of use. Buyers can purchase cloud solutions without upfront cash for software licenses, the cost for many moves from an asset acquisition to an operations cost. Access Not Hardware and Software = Cloud solutions are accessed via the public Internet and do not require purchase of hardware servers and OS/DB/App software infrastructure. Buyers can purchase cloud solutions without upfront cash for infrastructure components and do not need trained IT staff to install, configure, and mange the solutions on a company-owned infrastructure. Subscription Renewals Not Software Maintenance = Cloud solutions charge a subscription renewal fee for each new period of use and must earn your business with every renewal. Buyers can more easily opt-out of a renewal and switch because upfront costs were lower and they have no unused “shelf-ware”. 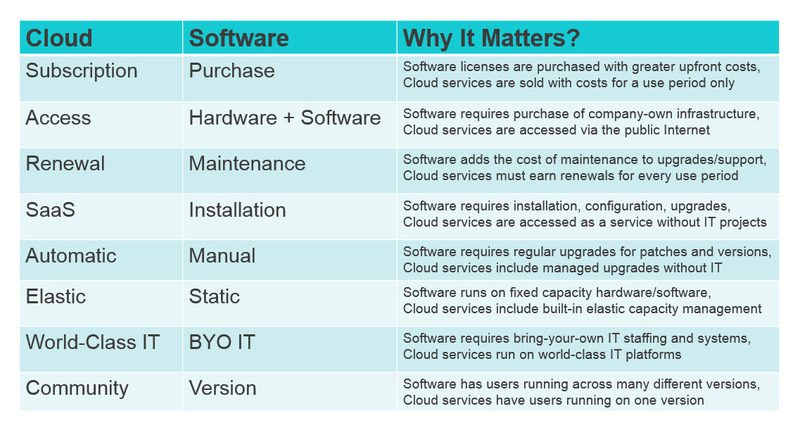 Software as a Service (SaaS) Not Installation = Cloud-based solutions are accessed not installed, you don't run them on a company-owned infrastructure. Buyers make decisions on implementation and use of new features but do not staff for and are not involved with IT installations, configuration, or operations issues. Automatic Upgrades Not Manual = Cloud-based solutions deliver continuous upgrades to you, the upgrades are automatically managed, and are not optional. Buyers cannot opt-out of new releases but also are not responsible for an upgrade process and receive continuous innovation with every new release. Elastic Compute Resources Not Static = Cloud-based solutions run on elastic cloud computing resources which dynamically allocate more computing capacity as end-users require it. 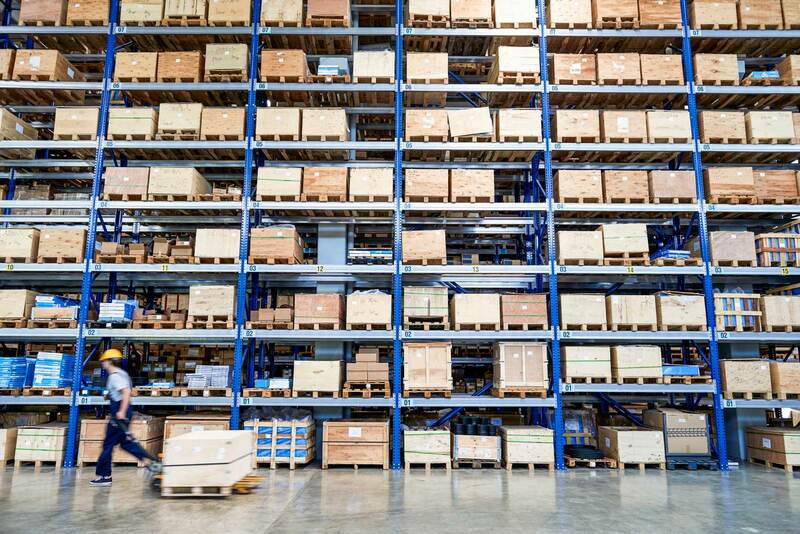 Buyers do not have to budget for peak requirements, seasonal workloads are handled automatically, and expansion across sites is managed via contract changes with vendors. World-Class IT Not Build-Your-Own = Cloud-based solutions run some of the most sophisticated IT infrastructures available today such as those provided by Amazon (who we use at Pacejet) to leverage hundreds of millions of dollars in redundant hardware, networking, staffing, and other resources. Buyers focus on using systems in their business and not on recruiting, managing, training, building an IT infrastructure to keep up with the level of investment being made by large platform vendors. One User Community Not Many Versions = Cloud-based solutions run hundreds or thousands of users on the same version of software, allowing users to communicate, collaborate, and share experiences as they use the solution. Buyers don't have to be aware of what version they are on and can interact with and share experiences with any other user running the same application. Purchase Not Subscription = Software solutions require an upfront license purchase. Buyers need to come up with more cash upfront, typically view the purchase as an asset acquisition, and more financing and approvals are required. Hardware and Software Not Access = Software solutions require upfront purchase of hardware and infrastructure software (e.g. OS/DB/App) along with training IT staff to install, configure, and manage the solutions on company-owned infrastructure. Buyers need to make significant commitments in funding the infrastructure of technology and people used to run software applications. Software Maintenance Not Subscription Renewal = Software solutions charge 15-20% annual maintenance fees which typically cover fees for accessing help-desk and online support resources as well as access to install-able software updates for bug fixes and new software versions. Buyers make annual decisions on funding maintenance based on support needs and plans to install upgrades. Installation Not Software as a Service (SaaS) = Software solutions are installed on a company-owned infrastructure and run by internal IT staff. Buyers make annual decisions on funding the IT staff team that will run, manage, and operate internal software applications. Manual Upgrades Not Automatic = Software solutions require a manual upgrade process to install bug fixes and new feature releases from vendor-published install packages. Buyers make annual decisions on upgrades, control when and if to install them on company-owned servers, and use internal IT staff or consultants to install upgrades and trainer users on new versions. Static Compute Resources Not Elastic = Software solutions were generally built in an era of fixed compute resources and not built for PaaS (Platform as a Service) infrastructures with technologies like auto scaling built into them. Buyers make capacity needs decisions on company-owned infrastructure, make buying and upgrade decisions to allocate appropriate fixed capacity to solutions, and manage upgrades at sites or across sites through both contract changes and new projects to install/upgrade systems. Build-Your-Own IT Not World-Class = Software solutions run on company-owned servers which must be configured, run, and managed by a team of IT professionals. Buyers must build their own infrastructures or lease infrastructures and build their own teams and invest to keep up with large platform vendors. Many Versions Not One User Community = Every install of software on a company-owned infrastructure is a unique configuration of the system that is unlike the install at every other company and individual businesses control which minor and major upgrades are installed on their systems. Buyers can interact with other users but must be aware of versions, feature differences, and infrastructure differences across every company running their own installed software system. Clearly there are very big differences between on-premise software and cloud-based software technologies, how they work, and the types of decisions, ownership, investments, and value for buyers with each type of solution. The chart shown below brings some of the key differences we've identified in this post together into a more comprehensive single picture. What you may notice as you look at the chart is that while many of the dimensional differences between the two solution types pit lower cost / less-complexity on the cloud side against more control on the software side, cloud-based solutions are generally much better positioned to deliver continuous innovation and improvement over time with less investment. At Pacejet we believe, as do many others in the IT marketplace, that this is the key reason why cloud solutions have reached the “tipping point” in growth as the preferred delivery architecture for business solutions. Add Cloud to the Name = Changing the name of a software application or suite to add “cloud” and then perhaps adding a subscription contract option doesn't change the technology. Look for additional upfront costs, low cloud adoption, and all of the same operational requirements as typical software solutions. Our App is Cloud Because It Runs in a Browser = Many hybrid, plug-ins, and bolt on tool-bars simply move a software application to run via a web browser but it's still managed and delivered as a software. Look for additional upfront costs, slower upgrades, fragile integrations, and other complications. So how does Pacejet stack up to our own criteria for a cloud application? In the final analysis the argument of whether a cloud architecture or software architecture is "better" will probably come down to your business needs, your budget, and your desire to control your own IT team and manage your own software / hardware systems or spend those resources elsewhere and leverage cloud solutions. At least the decision is easier since the distinctions in technology and value proposition between software and cloud-based solutions have never been clearer. Interested in learning more about Pacejet solutions or an existing user with questions or needing help? Call Pacejet at 877-722-3538, email info@pacejet.com, or visit Pacejet.com.